Register by choosing your options above and clicking “Add to cart”. After you click the “Add to cart” button, click “View cart” at the top of the page to leave the page and proceed with your registration. All course participants will need to lodge at Mount Soma and stay onsite for the entire retreat. If you would like to maximize the benefits of the course, we recommend arriving at Mount Soma 2 or 3 days early. Learn about the Advanced Techniques Courses. 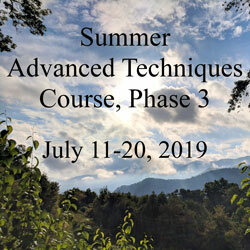 Package includes Advanced Techniques Course, all meals, all meditations, and 10 nights lodging (nights of July 10-19, 2019). Please note: The Advanced Techniques Course starts at 7:30 am with breakfast on Thursday, July 11 and ends with dinner on Saturday, July 20. If you would like to come early or stay longer and meditate with the Mount Soma Ashram, there will be additional charges payable upon departure. Early registration discount of $200 if you register before March 31. With the Classic Option, no work/activity shifts are required. Participants do all meditation rounds (4-5 per day), attend all lectures, and have the option of attending temple ceremonies. They are NOT required to do activity shifts such as food preparation, cooking and cleaning. Student Union lodging options include Basic (shared room), Semi-private (2 people per room), and Private. All accommodations are first-come, first-served. The Economy Option is discounted from the Classic price. Economy participants do all meditation rounds, are able to attend all lectures and temple ceremonies, and have 1 activity shift per day, such as food preparation, cooking and cleaning. Student Union lodging options include Basic (shared room), Semi-private (2 people per room), and Private. All accommodations are first-come, first-served. The Seva Option includes free room and board for the 10 days. However, people choosing this option are still required to pay the Advanced Techniques Course fee. The Seva Option is designed for people who like to help out, and who want to save money by volunteering. Seva (service) participants help out with a large portion of cooking, cleaning and dishes. Generally, these participants do fewer rounds a day than the rest of the group with a minimum of 2 rounds per day. Seva participants will be able to attend all retreat lectures unless they interfere with meal preparation, and will be able to attend temple ceremonies if time allows. In order to qualify for the Seva Option, applicants must have previously attended at least one paid retreat.